Why Gingrich Opposes Recommendation Against Routine PSA Tests : Shots - Health News Newt Gingrich invoked Dr. Andrew von Eschenbach, former head of the National Cancer Institute, in criticizing proposed changes in prostate cancer screening. A close watcher of von Eschenbach at NCI questioned whether he is the right person to lean on. 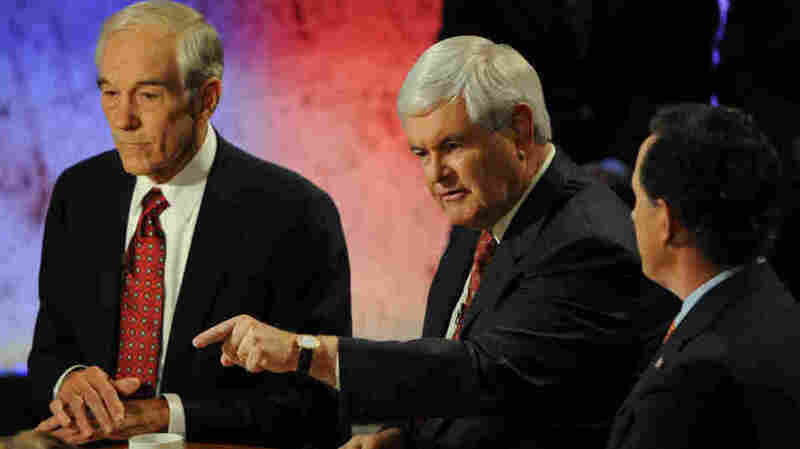 At last night's GOP presidential debate in New Hampshire, Newt Gingrich condemned the government's latest effort to discourage men from routinely getting blood tests for prostate cancer by citing the views of Dr. Andrew von Eschenbach. Gingrich stressed some of von Eschenbach's prestigious bona fides, including heading the National Cancer Institute and practicing at one of the country's major cancer centers. But Gingrich didn't mention some other aspects of von Eschenbach's background, including his belief that "the suffering and death due to cancer" could be eliminated as early as 2015, as well as his affiliation with one of Gingrich's think tanks and a think tank of a major proponent of the PSA blood test. I am really glad you asked that, because I was just swapping e-mails today with Andy von Eschenbach, who was the head of the National Cancer Institute, the head of the Food and Drug Administration. But before that, he was the provost at M.D. Anderson, the largest cancer treatment center in the world. And he wrote me to point out that the most recent U.S. government intervention on whether or not to have prostate testing is basically going to kill people. So, if you ask me, do I want some Washington bureaucrat to create a class action decision which affects every American's last two years of life, not ever. I think it is a disaster. I think, candidly, Gov. Palin got attacked unfairly for describing what would, in effect, be death panels. And what von Eschenbach will tell you if you call him is, the decision to suggest that we not test men with PSA will mean that a number of people who do not have — who are susceptible to a very rapid prostate cancer will die unnecessarily. But Paul Goldberg, publisher of The Cancer Letter, a weekly newsletter that chronicled von Eschenbach's tenure at NCI, disputed the notion that he should be viewed as a go-to source on the value of cancer screening tests, such as the PSA. "I wouldn't call him an expert in prevention," Goldberg said. He said Gingrich's laudatory praise of von Eschenbach was "eminence-based medicine," not "evidence-based medicine." In any event, von Eschenbach is a senior advisor for Gingrich's think tank, the Center for Health Transformation. He's also a senior fellow with the Milken Institute, whose founder, Michael Milken, credits the blood test with saving his life. We weren't able to reach von Eschenbach for a comment. We called Gingrich's campaign headquarters, but a campaign worker said they didn't have his contact information. Oh, and the "death panel" claim about the law? That has consistently been debunked as false.